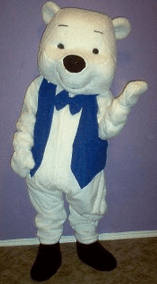 Bear mascot costumes: buy direct from the manufacturer and get the best deal on the most awesome costumes on the market. Our costumes are lightweight, have soled boots, have a fan in the head and are unbreakable. You want costumes that last and are comfortable so look through our selection or make a specific request. I'm sure we can help. THIS IS THE A GREAT TEDDY BEAR. CAN BE USED YEAR ROUND. DURING X-MAS AS A CHRISTMAS BEAR, DURING VALENTINE AS A DELIVERY BEAR, AND DURING THE YEAR FOR BIRTHDAY PARTIES AND ANY DELIVERIES. get different outfits for your bear! 75 for hat and scarf, 75 for a vest and tie, 75 for shirt and baseball cap, 75 for cowboy hat and boots.